The Waterfront stamp set has become a favorite set from the new Occasions Catalog - and for good reason! It is a wonderful set - with great watercolor like images - and some great words as well. With this set, you can create so many different scenes - woodland, mountain, tropical, and it's perfect for masculine cards! So much to love! I chose a monochromatic color scheme - blacks, and grays and then added a little pop of red. 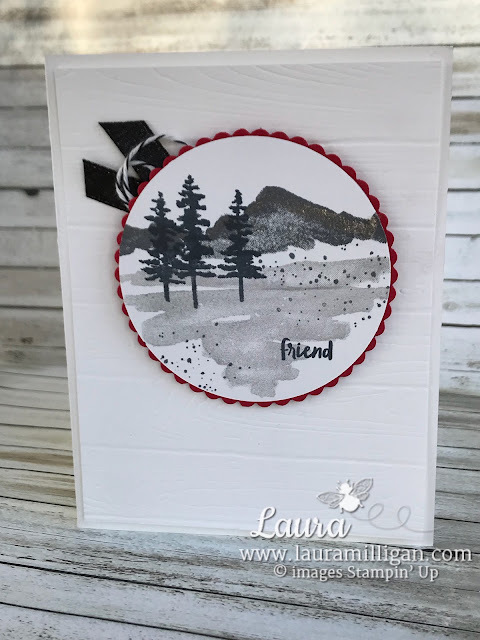 I embossed a quarter sheet of Whisper White card stock with the Pinewood Planks Dynamic Embossing folder, and attached it to my thick Whisper White cardstock. 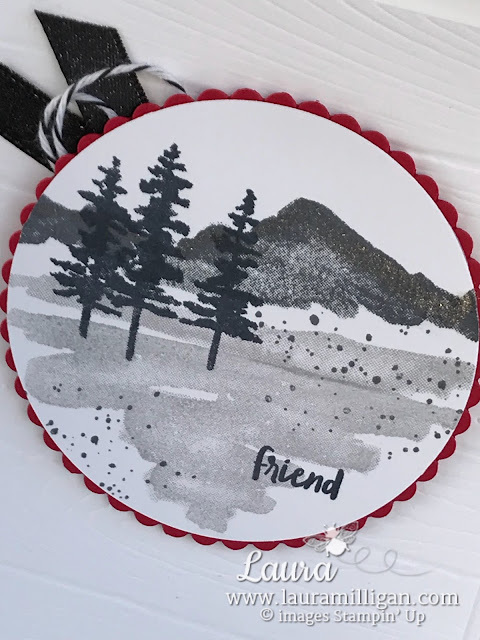 I cut a circle with Whisper White cardstock, and also a Real Red scalloped circle, using framelits from the Layering Circle framelits. Next, I stamped the images on the circle- Basic Gray for the mountains, Smoky Slate for the ground, Memento Black for the trees and words, and the little dots were stamped with Basic Gray. I brushed a little bit of Clear Wink of Stella across the top of the mountains to add some shimmer - sparkling snow perhaps?? I attached the circle to the Real Red scalloped circle. I made a loop with Black/White baker's twine and folded a piece of Black Shimmer Ribbon in half - and used dimensionals to place these behind the circle. To finish the card, I used dimensionals to attach the circle to my card front.